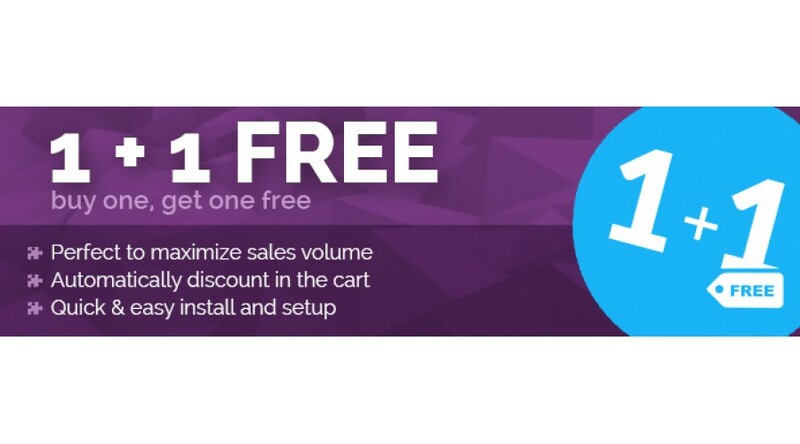 "Buy one, get one free" marketing technique is perfect to maximize sales volume. This is used very effectively because customers will make a purchase for the good value of the offer. Also this technique is very good due to the physiological aspect of it. Everyone likes free things and rarely will somebody turn down the offer when something is given to them for free. You can use this extension to increase sales, attract new customers and to keep old customers loyal. Promotional offers are crucial in the retail industry because it has many benefits and plays a large part in increasing sales, profit & revenue. The discount will automatically applied in the cart if the customer will add only 2 products in the shopping cart, each with quantity 1. If a product is already free or a voucher/coupon is used than the extension will not be activated. Your client will pay only for the product with the biggest price. Most common answered questions about 1 + 1 FREE.